Series 3 of Hasbro's GI Joe Kre-O blind bags have a lot of very cool characters to offer. But it took so long for them to come out that I was no longer carrying around my cheat sheet! I always use our decoder, and write down which numbers I want to get, but I'd given up hope of ever finding them in the wild. So I gambled on my memory, and picked up figure #04: Tomax! The Joes don't get cute bios the way Transformers do, but come on, you know Tomax: he and his brother's psychic connection is already silly enough that there isn't a lot of room to soften things without getting too ridiculous. 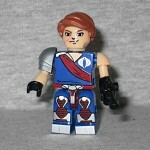 Tomax gets a new piece of silver shoulder armor, which will be nice if they ever get around to making a Zartan Kreon. He has complicated tampographs on his legs, to create those red and silver cobra-head kneepads the Paolis always wore. He has a complex silver belt painted on, and a red and silver codpiece. His red sash is present here, both on the front and back of his chest block - it runs over his right shoulder, and there's a silver Cobra sigil over his heart. They even remembered to make his left glove bigger than his right! The only flaw? A scar painted on his cheek - that was Xamot's thing. He comes with a gun, of course, but that's de rigueur for this line. What's really cool is that he comes with two grappling hooks, a length of black string, and a gray handle that can slide back and forth along it. That's a nod to the zipline the original 1985 versions came with - how fun! It's kind of ridiculous that Hasbro would do Tomax, but not Xamot. He'd darn well be in one of the upcoming series, or there's going to be trouble! This entry was posted in blog exclusive review, Hasbro and tagged GI Joe, Kre-O. Bookmark the permalink.